A quick tip to save you a little frustration. As new ASP.NET Core releases drop at regular intervals, you may find when you upgrade your app that everything works beautifully on your machine but then blows up spectacularly when you upload it to Azure. You’ll start seeing 500 errors about bad gateways and your app fails to start. This is often because the version of ASP.NET core you’re targeting hasn’t been deployed to Azure yet. Good news, you can easily check this for yourself. 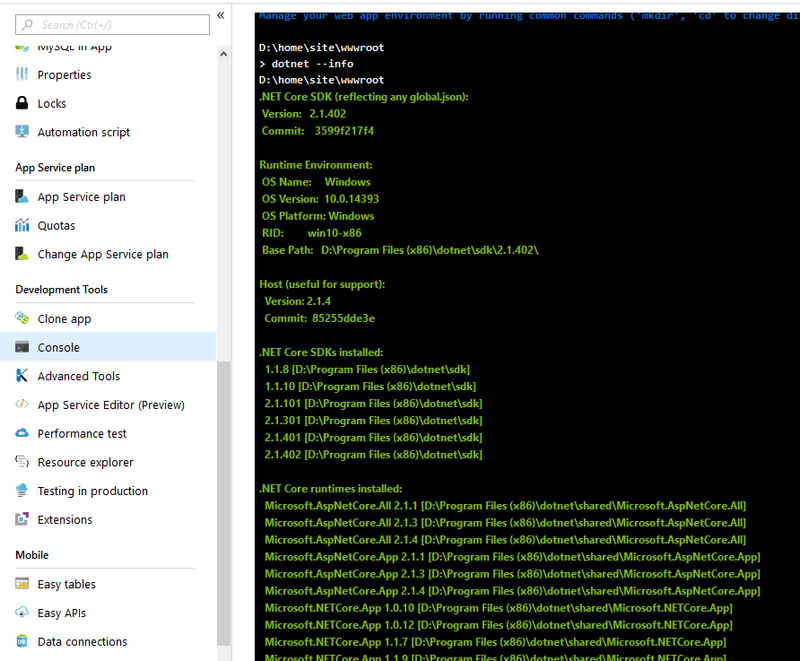 Head on over to your app service in the Azure portal, find the Console option in the left-hand menu. Type dotnet --info and behold, a handy list of precisely which versions of ASP.NET Core are available to your app.